Beginning in spring and well into summer, many different kinds of pesto recipes are featured throughout the food world. I’ve never been a fan of pestos. While I love the (typically) bright emerald green colors, I’ve always found them too heavy, too garlic-y, too something. Yet, the idea of grinding a vegetable or herb, fat(s), salt, and acid together producing a sauce is very appealing. So, I came up with this spinach and walnut sauce that I’ll stir into brown rice and garbanzo beans this evening. 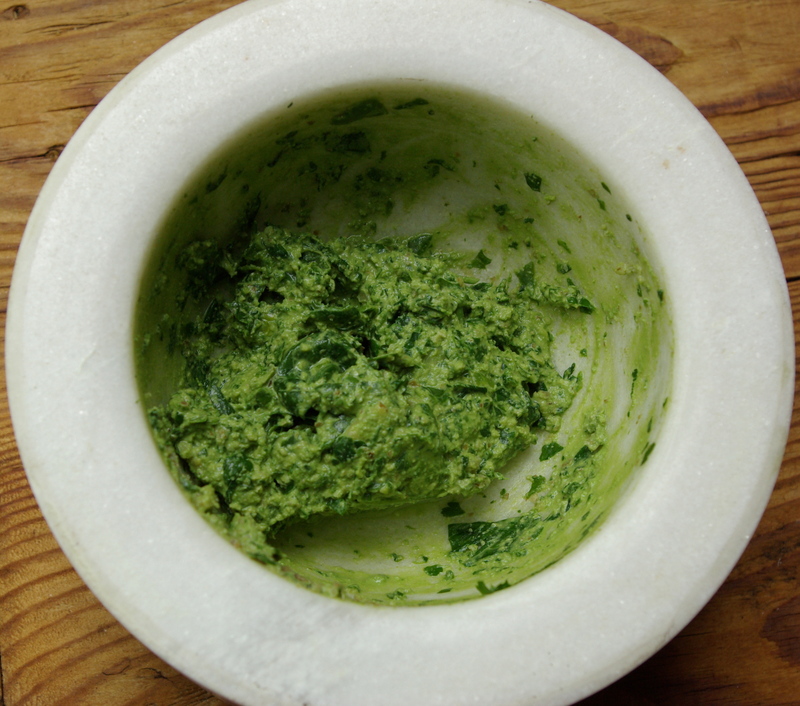 Served over a bed of wilted spinach with a sprinkling of chopped walnuts, the unpesto pesto looks pretty good. Pestos can be enjoyed on pasta or rice. They can be stirred into egg dishes, or spread onto a sandwich. Cook’s Notes: I found the garlic packs just enough punch. The lemon juice, while perceptible, is not overpowering, and the walnuts are a good amount of fat. 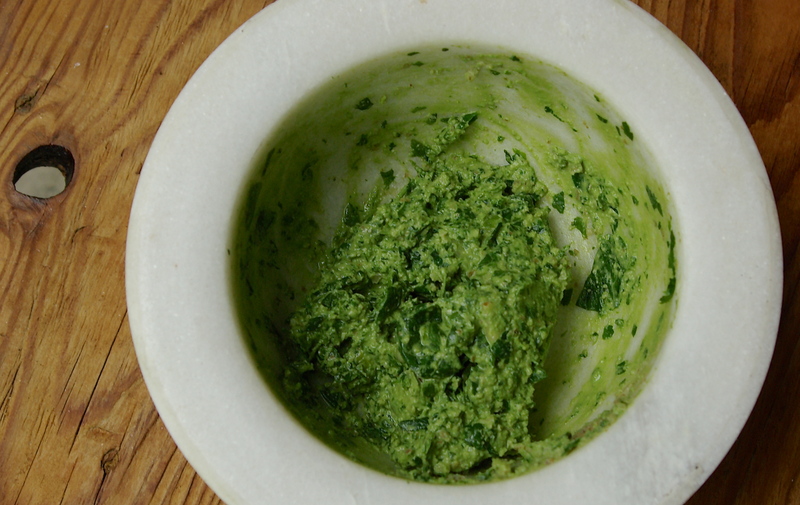 To make this into a more traditional pesto, add extra virgin olive oil to taste and desired consistency. All of these ingredients can be processed in a food processor. Or, if grinding by hand in a mortar and pestle, begin mashing the garlic, salt, and walnuts together. Once finely ground, add the spinach and parsley a handful at a time along with the lemon juice. Work in a circular motion with the mortar until desired consistency. Taste and adjust for salt. Yield: 1/2 c.
This entry was posted in Pesto and Sauces. Bookmark the permalink.